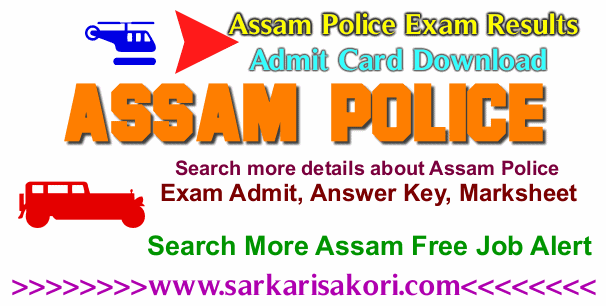 Assam Police Exam Results in 2018 Re-test Written Exam Admit Card Download for 1416 Nos. Assam Police Constable Posts for Dhubri, Barpeta & Nagaon District. 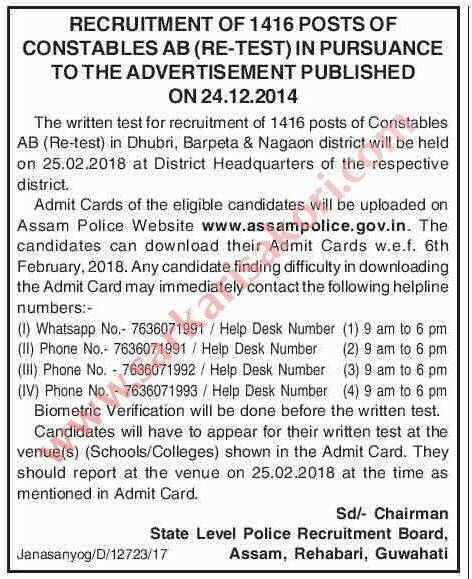 DOWNLOAD HALL TICKET/ADMIT CARD FOR THE WRITTEN TEST IN CONNECTION WITH RECRUITMENT OF 1416 POSTS OF CONSTABLES AB (RE-TEST FOR DHUBRI, BARPETA AND NAGAON DISTRICTS) IN PURSUANCE TO THE ADVERTISEMENT PUBLISHED ON 24-12-2014. The written test for recruitment of 1416 posts of Constables AB (Re-test) in Dhubri, Barpeta & Nagaon district will be held on 25.02.2018 at District Headquarters of the respective district. Admit Cards of the eligible candidates will be uploaded on Assam Police Website www.assampolice.gov.in. The candidates can download their Admit Cards w.e.f. 06-02-2018 (6th February 2018). Don't Miss to Read: Assam Forest Admit card Download. Biometric Verification will be done before the written test. Candidates will have to appear for their written test at the venue(s) (Schools/Colleges) shown on the Admit Card. They should report at the venue on 25.02.2018 at the time as mentioned in Admit Card. Assam Police has recently announced 2564 nos selected list of Assam Police Constable (DEF-1438 (UB)+SB-66(UB)+APRO-806+F&ES-114+SDRF-120 AND DELHI POLICE–20 (MALE-10 & FEMALE -10) in pursuant to advertisement dated 10.12.2015. Assam Police Written Test Marks For Recruitment Of 2564 Posts Of Constables (DEF-1438 (UB)+SB-66(UB)+APRO-806+F&ES-114+SDRF-120 AND Delhi Police – 20 (Male-10 & Female -10) in Pursuant to Advertisement Dated 10-12-2015. The Following Are The Answer Keys of The Three Series Of Question Booklet In Connection With Written Test Held On 25-06-2017 FOR RECRUITMENT OF 2564 POSTS OF CONSTABLES (DEF-1438 (UB)+SB-66(UB)+APRO-806+F&ES-114+SDRF-120 AND DELHI POLICE – 20 (MALE-10 & FEMALE -10) in pursuant to advertisement dated 10-12-2015. The following are the marks scored in the written test by candidates who appeared in the written test held on 25-06-2017 in all district headquarters across the state. The candidate may see their respective marks. If any candidate has any complaint with regard to his/her marks, he/she may submit written complaint within 3 days to their respective superintendent of police of the district for taking necessary action. You will be interested more in Assam Police Exam Result 2017-2018 or Assam Police Exam Admit Card Download for Retest & Latest.